Most Unificationists, following Rev. and Mrs. Moon, resonate with the heroic aspect of Puritan faith. Longing for a new heaven and new earth, forsaking family and/or nation, and total reliance upon God in a howling wilderness may not characterize contemporary Unification experience. However, “heroic faith” figured prominently in the lives of first-generation Unificationists. It remains an indelible part of the movement’s heritage and a living reality for those of any generation who continue the pioneering course. The problem comes with the more pedestrian labor of institution-building. Many Unificationists are deeply ambivalent about institutionalization. Some declare that they did not join the movement to start a church. Others question the need to support distinctively Unification institutions of higher education. There is unanimity as to the centrality of families but distress about marital and intergenerational conflict. In order to relate contemporary Unificationism to the Puritan model of success, it is important to distinguish between the small party of pilgrims who landed at Plymouth in 1620 and the much larger “second wave” who founded Massachusetts Bay Colony in 1629. Some 20,000 emigrated over the course of the following decade. 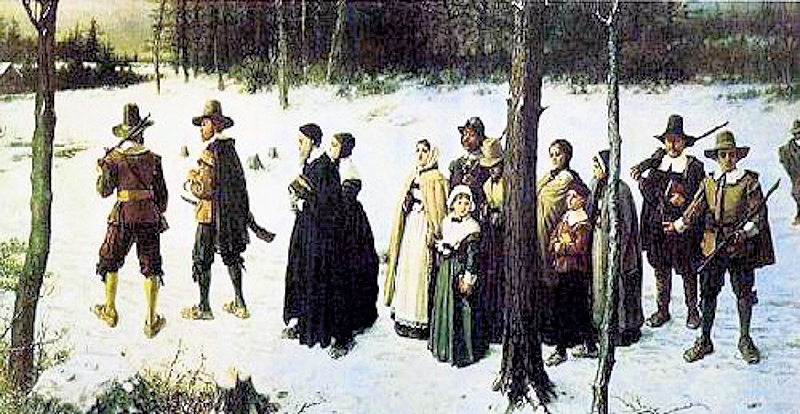 It was the “second wave” who assumed leadership in Puritan “New England.” Unlike the “pilgrim fathers” who were “separatists,” wanting only to separate from the irredeemably corrupt Church of England, the Massachusetts Bay Colony Puritans were “independents.” They understood themselves to be on “an errand into the wilderness” with the mission to set up a “holy commonwealth” that would serve as a model for the reformation in England and the rest of Europe. In fact, the Puritan “experiment” was in a state of collapse by the 1690s. The experiment ended but the Puritan sense of mission and the institutions they created continued, eventually becoming the foundation of a new “redeemer” nation. On coming to America, Rev. Moon stated his intention of launching a “New Pilgrim Movement” as the basis for “one world under God.” This article assesses contemporary Unificationism in terms of its alignment with the Puritan model of success, notably the core Massachusetts Bay Colony institutions of church, school and family. The Unification movement has an impoverished understanding of the church. In fact, it is questionable whether Unificationism possesses a doctrine of the church at all. This is far removed from the Puritans who were at odds with the Church of England not over theology, about which they largely agreed, but over conflicting conceptions of the “True Church.” The Puritans wanted to “purify” Anglicanism of “Romanist” vestiges and institute congregational governance. Since they understood each church to be under the direct lordship of Christ, they gave minute attention to congregational covenants some of which became models for secular governments. Church governance has been mostly an afterthought for Unificationism. Instead, the movement has been inclined to operate within existing patterns of Christian worship. If anything, Unificationists view the Church within the context of “the withering away of religion.” Religious institutions have no ontological significance. There is no “True Church” in the mind of God. In addition, Unificationist church governance is centralized and hierarchical, under the authority of central figures and their designated representatives. Congregationalist patterns that the Puritans championed have yet to exert much of a countervailing influence. Puritan Massachusetts was renowned not only for its faith but for its learning. Some 130 Cambridge-educated divines emigrated during the course of its settlement, making it one of the densest concentrations of intellectual energy in history. Its founders established Harvard College in 1636 to “advance learning and perpetuate it to posterity, dreading to leave an illiterate ministry to the Churches when our present ministers shall lie in the dust.” Historians of Puritanism remind us that they never dreamed the truths of scripture were to be maintained against the evidence of reason, science and learning. They rejected the chaotic emotionalism of religious “enthusiasts” and struggled to maintain the harmony of reason and faith, science and religion, the union of head and heart. Unificationism resonates with Puritanism as an intellectual as well as a religious movement. The movement’s teachings appealed to college-educated youth from its beginnings and Unificationism extended its reach to a broad sector of academics over time. The movement also has developed an impressive number of schools, including institutions of higher education in its founding generation. Unificationism, like Puritanism, seeks to balance science and religion. The question is whether the movement’s theological and intellectual emphases will attain permanent institutional expression. Unification Theological Seminary failed in its initial effort to launch a college. Large-scale Unification-related institutions such as the University of Bridgeport and Sun Moon University combine some Unification emphases with secular models of higher education. “Pilgrims Going to Church,” painting by George Henry Boughton, circa 1867. One of the anomalies of the Unification movement is its emphasis on the family and family values while at the same time calling for extended mobilizations of one or another spouse resulting in frequent family separations. On occasion, the movement has viewed family and mission as being in competition with one another. This is at odds with the Puritan experience. More recently, the movement has emphasized the priority of strengthening Unification families and being “strong first” in educating the next generation. A large number of Unification first generation couples were paired interracially, interculturally or internationally, and emotional intimacy took a back seat to public responsibility. This is changing and the movement’s next generation is inclining more toward the Puritan pattern of conjugal affection. Painting at top: Detail from “The Mayflower on Her Arrival in Plymouth Harbor” (1882) by William Formsby Halsall. 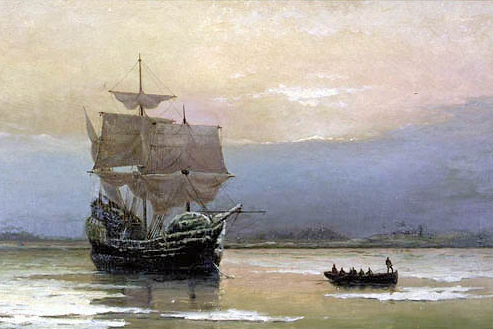 The Mayflower is shown at dawn after her landing in Plymouth Harbor and is portrayed as a symbol of the beginning of a new era. Courtesy Pilgrim Hall Museum. 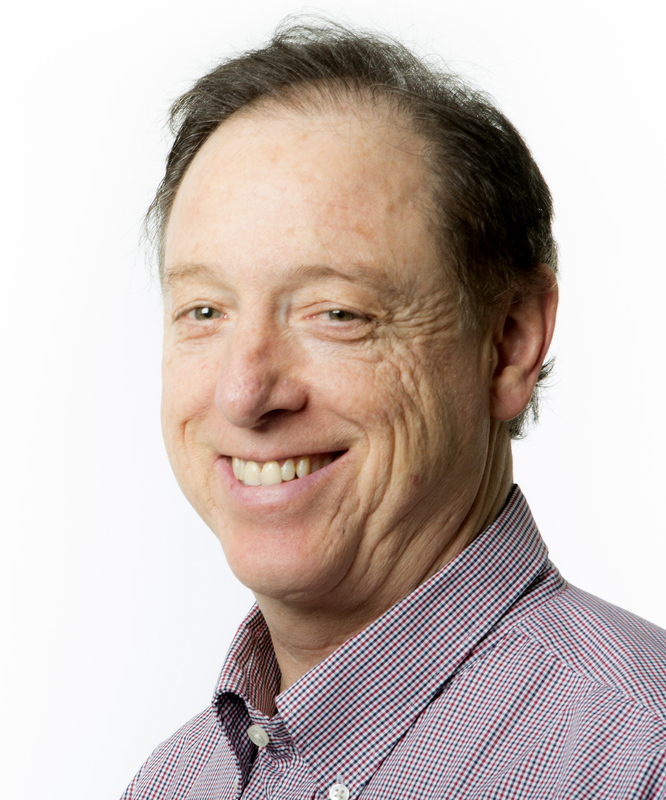 Thank you, Dr. Mickler. There are many parallels and differences and as a good historian, you point many of them out. There are parallels because human beings then as well as now have an innate desire to achieve the three blessings. There are differences related to technology and demographic changes that make today’s world a very different place from New England in the 17th century. These changes require more complex social institutions. The one thing that stuck out for me is that all of the social institutions you mention: church, school, and family are cultural institutions rather than political or economic institutions. Cultural institutions shape a person’s behavior and ability to achieve the three blessings. They have everything to do with raising children for the future. Today, in the West, culture has become significantly subservient to economics and politics: to economics through advertising, and to politics through what has become “politically correct” education legislation shaped by political pressure groups seeking to mold children at best as servants of their group. The nature of “church” doctrines will be different today because many scientific discoveries have shaped our understanding of reality and some “beliefs” have been supplanted by more accurate knowledge. But the role of connecting people to God, purpose, and self-motivation remains necessary. Our schools must teach people self-governance and civility. Families must impart core values, foremost of which is love and sacrifice displayed by parents. But, when wider social institutions are culturally relative, or subvert culture to politics and economics, the family is under siege. It will be important for Unificationists to create cultural institutions appropriate for our time that accomplish the goal of preparing people to attain the three blessings. This will require distilling what part of our traditions can be nourished and developed, and which should be discarded. There will be “conservatives” who resist change and “liberals” who disrespect the value and authority inherent in traditions, and maturity requires discerning the appropriate balance for our own situation. One thing is certain, putting money or power first over culture is the reversal of dominion and will lead to some form of serfdom instead of the dominion and true ownership God intended for each person in the three blessings. I think we need to stop using terms like “politically correct” when we mean to say incorrect politics. Many words are invented by “incorrect” people, and we ought to reveal this. “Politics” is a neutral word I think, and it can be righteous or unrighteous. The “distilling” of traditions can only be done by the Messiah, I believe. According to my personal understanding, many traditions that existed at the time of the Holy Blessing in 1960, like decent and respectful dressing style, ought to be kept, and other Heavenly traditions (often Korean) need to be identified, taught and adopted more and more. “Incorrect politics” would mean to me a political process that is faulty, or incorrect. Certainly our system is faulty, and legislation gets passed that forces schools to teach things that are harmful and immoral. When I used the term “politically correct,” I had it in quotation marks because current school curricula are loaded with mandates that come as a result of normal political activity that gives these mandates the force of law. Hence, they are politically “correct,” even if they are bad morally or lead to the development of children that are simply pawns of the groups that forced through the legislation. This is similar to the difference between “law” and “morality.” Many laws are immoral, but they were duly passed by the political processes we have. Enron leaders said they did nothing to break the law, even though their activity was viewed as immoral because they stole the pension funds of employees. They were able to do this legally by a series of corporate mergers and reorganizations that were “correct” in all the paperwork, but for all practical purposes it shifted money from one group to another. The real challenge is to develop political processes whereby the human laws created reflect divine laws. This will not happen until people making laws can distinguish that what has been passed down in tradition reflects divine laws (e.g., the Ten Commandments for example), or what we can learn from science can help us understand how to better help all to achieve the three blessings. This “distilling” is perhaps a messianic task, but each of us are meant to be messiahs, so I think it is a cop-out to say only the Messiah can do it. Putting such discernments, as those that affect raising our children, or passing good laws on someone else is not being a responsible parent and citizen. It is not what the Messiah teaches us to do. Thanks Gordon, and nice try, but no a “common house” was a communal dwelling for those without sufficient funds to build their own homes and the unmarried. Hence as I quoted, “Thus, only seven residences (of a planned nineteen) and four common houses were constructed during the first winter.” There are two primary sources for early pilgrim life, “Mourt’s Relation”, first published in 1622 and Bradford’s “Plimouth Plantation” (1646). I could be wrong, as it is long since I read them, but I think neither mentions the building of a church or a school. Indeed schools were rare in the Plymouth colony and the first real school was founded in 1660. Unificationists should be wary about repeating historically questionable information, regardless if the source is our founder’s words! David, I do not question the sources you cite or what a common house may have actually been. I also agree that Unificationists should not repeat such things as facts. So, in essence, I think we agree, and it was valuable for me to read the source you posted. My reply was an attempt to try to provide a possible basis for how the legend as recounted by Rev. Moon may have gotten started — a sort of literary criticism of the “Christianity in Crises” speeches, if you will. Repeating such information as fact, would be the same mistake biblical literalists often make. Certainly the story of Job was not likely a historical fact. The spiritual lesson, in this case putting God above your own survival, is frequently taught in epic narratives. I’m inclined to view the story as such, rather than discounting the spiritual value of a text because the story wasn’t factual. At the current time in the Unification Church, it is unfortunate that people have to argue many spiritual things with literal words. The worst, for me, is when people who edit books like the Cheong Seong Gyeong do not list their names and state their purposes in them; after all, these books all involve subjective interpretations, and if we know who compiled them and why, it is easier for a scholar to later understand the product. We know all books are written by humans for purposes, and not literally by God. In particular, I find De Montalembert’s take on the “Sabbatic contest” quite remarkable. Reminiscent or simply affirmative, perhaps, of Cor. 9:24, Chariots of Fire and even Dan Fefferman’s wonderful “All My Brethren”…ah…how we love to compete. And then share the sheer joy of either (or both) the experience of observing “the contest” or actually being part of it. Do I hear an Amen (or Aju)? In the Leadership class I am teaching at Barrytown College, our textbook has a chapter on “Shaping Culture and Values.” It points out that “stories” are a common mechanism to enact cultural values for organizations. The textbook notes: “A ‘story’ is a narrative based on true events that is repeated frequently and shared among employees. Leaders can use stories to illustrate the company’s primary values… In some cases, stories may not be supported by facts, but they are consistent with the values and beliefs of the organization” (emphasis added). The latter statement may apply to the “story” of the Pilgrims in Unificationist lore. Mark, there is a forthcoming article on Vaclav Havel in the June 2015 issue of the International Journal on World Peace, where it is argued that stories are a way of weaving together a plurality of perspectives, a way to bring unification amidst diversity. Like the Hindu story of the blind men and the elephant, that meta-narrative is an attempt to tell a story that unifies all the perspectives of the blind men. Creating such a meta-narrative for Unificationism strands today would be an interesting task for UTS. The “story” of the Pilgrims, though not totally factual, evokes a certain nostalgia, a longing to fulfill what others have tried to fulfill in the past. Telling the story touches the heart and helps those who hear it to be emotionally aligned, or in energetic congruence, with the spirit of the noble and just cause of building a new world with the right priorities. It is known, in church and/or in business, that when people’s hearts are stirred, they are more likely to spring into action and activate a vision in their own mind. They will be motivated. Recently, I watched (on Netflix) the movie, 17 Miracles. It is a most powerful story of faith, perseverance and heroic resilience — and a great example of the power of a story. A good pictorial PowerPoint and study of this topic is here. Its title is: “Puritan Meetinghouse and Church Architecture, 1630-1830: A Study in Sanctity of Place,” by Lori Pastor. As Pastor comments, “The Puritans did not have a specific plan for their places of worship. They did know that these places would be called “meetinghouses,” quite literally a “house-like” place in which to meet… Always in the center of town, where New England town commons are today, these meetinghouses were the sites of weekly and sometimes daily Puritan gatherings. They were constructed in the same wattle-and-daub style as colonial homes… Excluding the front addition and the cupola — later additions to Old Ship — notice how difficult it is to tell which is a meetinghouse and which is a home.” Later on, says Pastor, when the need to separate business from church occurred, a second floor was constructed from the balcony of the meetinghouse and designated just for church meetings while the first floor remained for business meetings. Perhaps we should also address the Puritan model of success in terms of the retention issue. I’m thinking particularly of the so-called “half-way covenant,” which allowed second-generation Puritans to be accepted by the church without the conversion experiences that characterized their parents’ religious life. To me, this parallels our own recent practice of allowing second-generation members to be blessed in marriage without the matching process, and even to be blessed with “outsiders.” Personally I welcome this process, but I also recognize that the watering down of Puritan faith led to lukewarm Congregationalism on the one hand, and people leaving the Puritan tradition for Baptist and Methodist faiths in later years under the influence of revival movements. So I ask, is the half-way covenant a model of success, and what lessons should we draw from it? When children come home to visit their parents, isn’t it most important that they made it home? Will the parents question what vehicles they drove and judge them on that? Religions could be compared to vehicles that help us make our way home to God within, find Him/Her in our heart. When we go to the spirit world, what will the most important be? That our hearts have grown so full of love for God and our fellow men and all the rest is details. I believe that the Puritans followed their hearts when they made the “half-way covenant” because our way to God should not split families. That would violate the world of heart. Some religions do ostracize their members, cut off the bonds of heart as punishment for not following the “Word” or their interpretation of it. Isn’t that missing the point though? Isn’t a grave mistake made when the rigidity of the belief pierces the heart and tears relationships apart? Does that mean anything goes and values and virtues can be thrown out? No, it doesn’t. But as parents, we know that we will love our children no matter what path they follow even though they may not choose the “make and model” we chose. So in each period of history, decisions have to be made. They will be different because times and circumstances change but if the heart is followed, they will be the right ones.